A young group of boys bully kids at school. Suddenly the boys start to get injured after bullying a kid. The leader of the group, Sully, notices a little gnome like creature appearing when their bullying rubber banded back to them. Sully tries to make a deal with the nature spirit, Karmack, not understanding that what they were doing hurts others and Karmack was balancing good and bad to be even. Excellent way to explain laws of karma to children. I think it was a great idea to have the bully as the main character. Stories like this are usually written with the kid who is getting bullied not the one dealing it out. It a refreshing change. I could see the character Karmack getting a series of books. 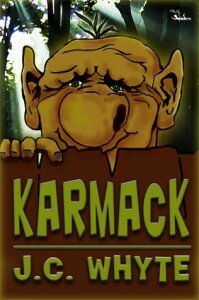 Since Karmack is a nature spirit we could see his family and friends. If there is spirit that balances his people when or if they do something bad. You could pretty much go anywhere with a fantasy character like Karmack.